Fought for justice, honor, pride. The Soul Cairn is a realm of Oblivion filled with the trapped souls of mortal dead. Rather than being ruled over by any Daedric Prince, it is controlled by mysterious beings that call themselves the Ideal Masters. When a soul is captured by a Black Soul Gem, it is transported to the Soul Cairn to roam for eternity. The Ideal Masters believe that by freeing mortals from life and dooming them to eternal undeath, they are being saved from meaningless hardship and gifted with peace. In order to enter the Soul Cairn, a mortal usually must be dead. This can be achieved by partial soul trapping, or by becoming undead. The realm was once accessible from the voidgate of the Battlespire, but the link was severed after the citadel was destroyed. The Soul Cairn is filled with all manner of undead. Some forms are unique to the realm, such as Bonemen, Mistmen, and Wrathmen. Powerful mages once summoned undead minions from the realm using conjuration magic, but these spells were forgotten over time. In their hunger for souls, the Ideal Masters often strike deals with necromancers. In return for souls, the necromancers are given the ability to summon armies of undead from the realm, although they often fall prey to the Masters and end up trapped in the realm themselves. The Soul Cairn's landscape is desolate, bleak, barren and grey, marked by blackened, dead ruins, bones, gravestones and "soul fissures". Nothing grows in the realm, apart from dead trees and a type of fungus called Soul Husks The realm contains many structures associated with burial, such as the Coffin Chapel and the Boneyard. The Chapel of Love is a building which contains the Emerald Gates, a portal which can be used to teleport to any of the outer realms, provided the user knows the name of the realm. The Emerald Gates are powered by the Mana Font, which is controlled by three rods, the Rod of the Pilot, the Rod of the Pillar, and the Rod of the Passage, collectively known as the Fingers of Life. Lightning strikes the ground constantly, and lightning attractors can harness this power to create Black Soul Gems. The Ideal Masters hoard many treasures, guarded by their undead minions. They have many powerful servants, such as the three Boneyard Keepers and the Reaper. The Masters themselves sometimes physically manifest as gems in order to communicate or protect treasure. Some time in the Merethic Era, a Vampire Lord named Valerica fled to the Soul Cairn through a portal of her own creation with an Elder Scroll. The Ideal Masters, failing to claim her soul, imprisoned her within the Boneyard and assigned the Keepers to maintain a force field around the structure. Some time after this, the dragon Durnehviir, seeking to secure his mastery of the skies through the use of "alok-dilon" (necromancy), made a pact with the Ideal Masters in return for great powers of summoning. The Masters ordered him to guard Valerica until her death, but neglected to inform the dragon that she was an immortal vampire. After eras spent living in the Soul Cairn, Durnehviir's body became accustomed to the realm, ensuring he could never leave the Masters' service. During Mehrunes Dagon's invasion of the Battlespire during the Imperial Simulacrum, the Daedric invasion force entered the realm for use as a waystation between their own realms and their newly conquered domains. This displeased the Ideal Masters, as the Daedra were destroying their undead servants and plundering their treasure. 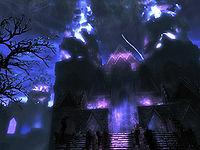 Several Morphoid Daedra were ordered to remain in the Soul Cairn by Xivilai Moath. Many mortal captives from the Battlespire were brought to this realm and murdered by the Daedric invaders, including Paxti Bittor and Kirel Aman, trapping their souls eternally unless freed. An apprentice battlemage from the Battlespire passed through the realm on a quest to save a fellow apprentice from Dagon. This hero freed many trapped spirits, and was aided by the Ideal Masters in escaping the realm through the Emerald Gates into the Shade Perilous. The apprentice was eventually successful in halting the flow of Daedra through the Soul Cairn by forcing them to relinquish their hold on the newly-conquered realms. In 3E 433, Saint Jiub was soul trapped by dremora during a Daedric attack on the city of Kvatch, and his soul was sent to the Soul Cairn. In 4E 201, the Last Dragonborn and Serana entered the Soul Cairn in search of Valerica and her Elder Scroll. They defeated many of the Ideal Masters' servants, retrieving the scroll and rescuing Valerica. For game-specific information, see the Battlespire walkthrough and the Skyrim article. This page was last modified on 9 June 2018, at 00:25.